Kadhi pakora s a very delicious and spicy recipe prepared.with chickpea flour(Besan) and curd. It goes best with rice and chappati(wheat flour)lunch or dinner time. 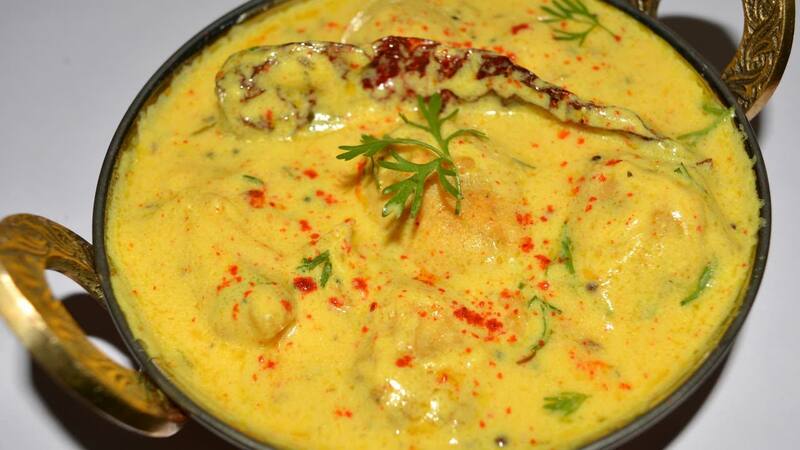 Kadhi pakora making time remembers only one thing is important pakora should be soft then it can be absorbed kadhi. Take a big and deep bowl, add all ingredients along with1/2 cup of water, mix well to make a thick batter. Heat oil in a deep nonstick or a heavy base deep pan and drop spoonfuls of the batter into the hot oil and deep fry at a time till they turn golden brown in color from all the sides. Drain on a kitchen towel or oil absorbent paper and keep aside. Combine the curds, besan, turmeric powder, red chili powder, ginger powder and two cups of water in a deep bowl and whisk it. Now Keep that aside. Heat the oil in a deep pan, add the fenugreek seeds, asafoetida, cloves, cinnamon stick and broken Kashmiri red chilies and saute on a medium flame 1-2 minutes. Lower flame, add the combined mixture of curd-besan, chili turmeric, ginger mixture, kept aside, stir it regularly till it is boiled.After boiled reduce it to medium flame and cook it for 8-10 minutes, add salt to taste and add pakoras mix gently and cook 1-2 minutes. Heat pure ghee in a small pan, add chili and Kasuri methi leaves. Serve kadhi with rice and roti, nan, rumali roti.